Single-access laparoscopic surgery is rapidly gaining popularity but is accompanied by a unique set of challenges. Limitations in this technique are characterized by a loss of surgical triangulation and counterintuitive hand movements. Flexible laparoscopy has evolved as a method to offset some of these restraints. 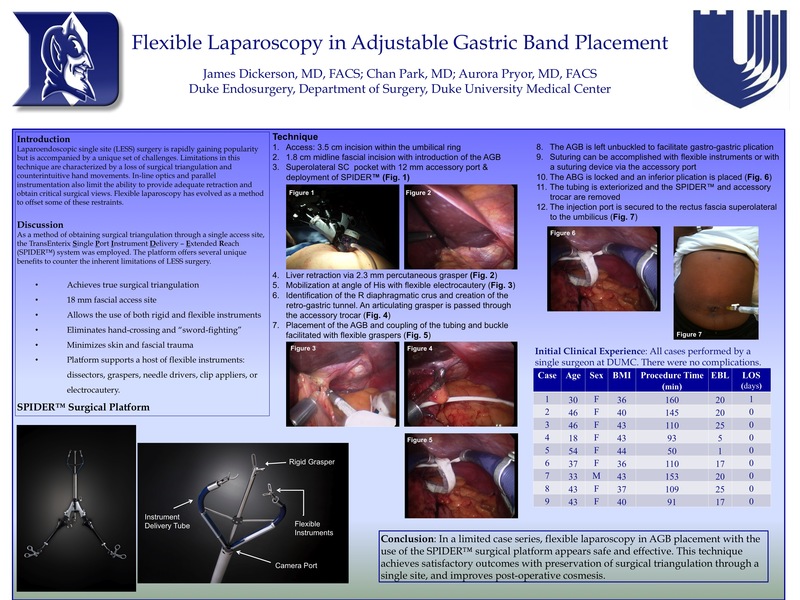 The technique presented demonstrates the use of flexible laparoscopy for the placement of an adjustable gastric band. The Single Port Instrument Delivery-Extended Reach (SPIDER) Surgical System was utilized as a method of achieving surgical triangulation via single site access. A 3.5 cm incision is created at the umbilicus, which also serves for final injection port placement. An additional 11 mm port was introduced through the surgical incision to facilitate creation of the retrogastric tunnel and anterior gastric fundoplication. Retraction of the liver was accomplished with a percutaneous 2.3 mm grasper. The procedure was completed in 63 minutes with no complications. CONCLUSION: Flexible laparoscopy offers a method to minimize surgical incisions and maintain the laparoscopic tenet of triangulation. This technique offers a way to minimize incisions while maintaining patient safety.